AutismWonderland: A Cure? No Thanks, We'll Pass. "Do you hope there will be a cure for autism?" I get this question from time to time. And there are some well known organizations who raise money and use a portion of funds in search of a "cure." But when I think of disease, I don't think autism. The Autism Society Of America (ASA) defines as a complex developmental disability that typically appears during the first three years of life and is the result of a neurological disorder that affects the normal functioning of the brain, impacting development in the areas of social interaction and communication skills. Both children and adults with autism typically show difficulties in verbal and non-verbal communication, social interactions, and leisure or play activities. So since autism is a disability not a disease, a cure really isn't needed. It's not like the doctor who diagnosed The Boy said to us: I'm sorry, your son has autism and he'll have 6 months to live. Autism needs intensive therapies, specialized programs, specific methodologies to meet the unique needs of each child and adult. It needs patience. Acceptance. Unconditional love. More patience. Hope. Respect. Compassion. Wait, did I mention patience? Diseases need to be cured. Autism needs to be understood. We need to understand that life doesn't always run on an exact timeline. Not every achievement or milestone needs to happen for every person at the same time. We need to understand that different is not always a bad thing. Different doesn't need to be feared or cured. When I think of all of things people with autism have contributed to our society - why would we want to cure that? There is a great kids book called "Different Like Me: My Book of Autism Heroes" by Jennifer Elder. Some of heroes highlighted are: Lewis Carroll, Albert Einstein, Andy Warhol, Sir Isaac Newton and Temple Grandin. And when I think of The Boy - his dimpled cheeks, his infectious laughter, his sweet disposition, his eagerness and willingness to learn. When I watch him working really hard to complete a task. And when he's completed it, looking up at me for approval. When I remind him to walk and not run around the apartment, and I see him trying so hard to walk - one foot slowly in front of the other as if he's mentally telling himself to: walk, walk, walk. Those moments when he points to his favorite book (the one that I just finished reading for the 5th time in a row) and says: Read to me Mommy. Why would I want to cure that? Those moments when I call his name three, four, five times - asking him to look at me. Those moments when he's somewhere else. Those moments when he's running around, back and forth, flapping his arms wildly and I can't get him to calm down or focus. Those moments when he's not using his words but mumbling to himself in a jargon that doesn't make sense - at least not to me. Those moments when we're in the park and I see "typical" children, the same age as The Boy, swinging on swings, playing catch and riding their bikes and scooters without the assistance of an occupational or physical therapist. Those moments when I watch children making friends and playing without any facilatation. Those moments when it's late at night, and I'm up thinking about his goals and IEP. I still don't want to cure The Boy of anything. All I want to do is work harder to understand him. As overwhelming as it might be at times, I don't think I would either. That doesn't mean that I don't hope for a great life for him, we will just have to work harder to get there. I even hesitated to write the word "harder"... I sometimes wonder if my son didn't have autism, would I still invest so much time into the little things? or would I just take things for granted? 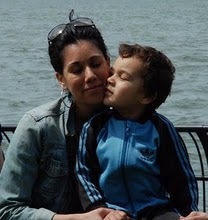 I think autism has made me a better mom. There is still a lot we can do, but I am with you... we don't need a cure.